This Rumble ended on 2005-05-01 00:00:00.0. He never should have allowed that kender to come inside. Tasslehoff Burrfoot may be an old acquaintance but he was still a kender and now he was loose in a Tower of High Sorcery. Raistlin shuddered to think of the trouble the kender would get himself into. He wasn’t overly concerned because anything that was truly dangerous should already be protected by magical Glyphs and Wards. But when it came to Tasslehoff Burrfoot the wizard knew that anything could happen. The best he could hope for would be for the kender to get himself killed, but Raistlin knew he could never be so lucky. The small sound of a kender voice drifted up from the darkness below. It said the one thing the wizard hoped he would never have to hear again. “Oops!” echoed off the walls of the stairwell. Raistlin cursed and hurried down the stairs to the basement of the tower. The kender had gained access to the chamber of the Live Ones. The black robed wizard hurried down the stairs and threw open the door to the chamber. What he saw before him amazed him. The kender had managed to create life! It wasn’t anything the wizard had ever seen before, but it was life of some sort. In typical kender fashion the kender had somehow accidentally struck on the right ingredients to form a new life form. The colorful blobs were flying around the room and making odd noises. Before long one of the Live Ones reached up and snagged one of the flying creatures. 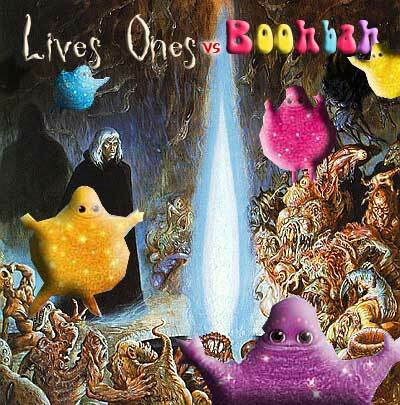 With an exclamation of “Boohbah!” the creature was dragged down into the squirming mass of flesh. The other flying blobs became agitated and descended upon the Live One to rescue their fallen comrade.